I wanted to start Part 2 with the beginning chapters that put the rest of the book in perspective, but this issue seems timely enough to skip to. 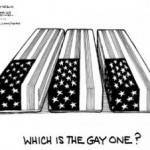 Chapter 21: Gays in the Military, by Joe Dallas, co-editor and main author of the book. Romans 1:26-32: Paraphrased: Furthermore [re the example of homosexuality], since they did not think it worthwhile to retain the knowledge of God, he gave them over to a depraved mind, to do what ought not to be done. Thus, since skin color dictates WHO someone is, opposition to the military integration of African-Americans was “unreasonable prejudice.” Unlike the perfectly reasonable prejudice it takes to define WHO a person is as being WHAT they’re attracted to (read: genitalia). It’s a glorified defense of the “ick factor.” And since when is squeamishness an indicator of military readiness? He also quotes Elaine Donnelly, executive director of the super-duper anti-gay Center for Military Readiness. 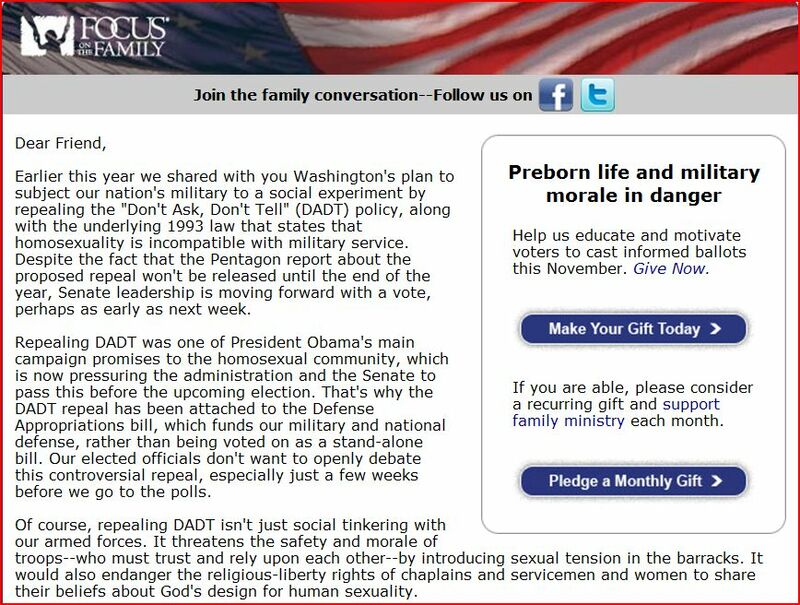 Of course, repealing DADT isn’t just social tinkering with our armed forces. It threatens the safety and morale of troops–who must trust and rely upon each other–by introducing sexual tension in the barracks. It would also endanger the religious-liberty rights of chaplains and servicemen and women to share their beliefs about God’s design for human sexuality. Open window, insert pro-gay polls. So, “it could be argued” that Joe Dallas and Focus on the Family consider bunking with a half-cocked thief who’s driving habits have been proven to be fatal to be just the kind of confidence building cohesion that a military unit needs. That, and the feelings of discomfort that may accompany dropping the soap in the shower in front of an ex-con. Patrick, as usual, well-argued. I just had a conversation last night with my conservative parents about my sexuality and I am coninually amazed, just as I am in reading some of these quotes, at the ignorance and specious reasoning abilities of conservatives. I used to think that this accusation was mere liberal animus toward the “enemy,” but more and more I have discovered it to be true. There is something almost uneducated about these people. I remember in college them telling us that we were not there to learn “what” to think, but “how” to think. I’ve taken that to a whole new level as I am now almost done with a masters in psychology. Lack of education correlates highly with conservatives. Is it possible that we get books like this and arguments like those of my parents, because they never learned how to think, but are just regurgitating what they’ve been told (by the likes of Rush Limbaugh and others??)? I’m sure this conclusion is nothing new to readers of this blog; I guess I’ve just been impressed the past couple of days with the realization of just how true it is. Sad, really. Good for you that you are having these conversations with your parents. now, if we can just get all of the other gay people to 1) come out to everyone they know, and 2) have these conversations, I can go back to taking care of my husband. 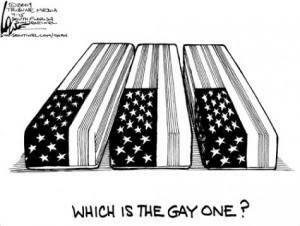 My friend Doug McIntyre of KABC Talkradio just mentioned this picture as one of the most powerful to be seen and said that DADT was the most ridiculous policy since racial segregation in the ranks. And look at how unnecessary and wasteful THAT was. His in support of open service and encourages discussion about it. He’s MSM, it’s a good thing he brings it up. Although I agree with your politics, I don’t agree with your assessment of “the other side.” Many people, no matter what their education level or political leanings, regurgitate what they’ve heard or read if they agree with it. Conservatives don’t do this anymore than liberals; it is human nature, period. Your argument that conservatives tend to be uneducated could be countered with the argument that liberals are brainwashed by their education. I know quite a few educated conservatives, and ironically, they said that they were taught “how to think” in college: they were taught “how to think like a left-wing liberal.” It didn’t even occur to them that there was another way of thinking until experienced real life. I myself grew up in a very liberal environment, and I had always believed that “liberal, democrat = good, compassionate;” “conservative, republican = selfish, uneducated.” I had not even met any conservatives until after I graduated college! 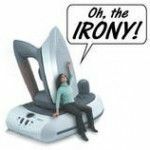 Now, having met and engaged in serious discussion with some wonderful, good-hearted conservative republicans, I can now say how divisive and specious the above thinking is. I see people everywhere, on both sides of the aisle, not thinking for themselves but spewing forth hateful ideology. And I’m sad to say that I’ve seen one too many fellow liberal denounce conservatives as hateful or fear-mongering, which to me is just regurgitating what liberals have been told by other liberals. At the end of the day, MOST people want the same ultimate goals: societal harmony, prosperity, well-being of adults and children alike. Conservatives and liberals disagree about how to achieve this. But there are truly many thoughtful, educated people on both sides of the argument, and to there are also many hateful, close-minded people on both sides. To suggest otherwise is to wear blinders to large portions of our population. Very good article and very articulate. As I have said before, homosexuality has been around from the beginning. Despite what people say, one is born that way. Religion has declared that it is a sin which translated into hate. If religion would just relegate itself to MORALITY the world would be different and probably pleasant and possibly NO WARS. There is not a single country where there no homosexuals and there no treatments or pills to change that. One may believe what one wants, but these are the facts. Study history.